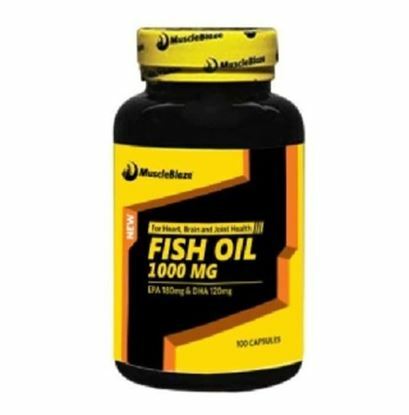 MuscleBlaze Fish Oil 1000 mg contains omega-3 essential fatty acids including eicosapentaenoic acid (EPA) and docosahexaenoic acid (DHA), long chain fatty acids with equally long names that cannot be made by your body. Together, DHA and EPA constitute good fats and antioxidants for fitness enthusiasts, athletes and body builders. Regular supplementation with MuscleBlaze Fish Oil 1000 mg supports muscle protein synthesis, improves post-workout recovery and reduces exercise-induced joint stiffness.